“Game-changing” might be a dramatic term, but that’s what comes to mind when describing the new HP Z38c Curved display. You see, every so often, a new product comes along which makes us rethink the way we work and HP’s stunning new Z38c display happens to be one of them. I’ve had the opportunity to use it for a few weeks and it has had a profound effect on how I work and my productivity. The Z38c is a member of HP’s Z Display Family, part of their highly esteemed line up of Z Series workstation products, aimed squarely at those doing high-end and demanding work including media and entertainment projects such as post-production, animation, editing, compositing and rendering. What makes the HP Z38c curved display so compelling is its immersive extra-wide screen. 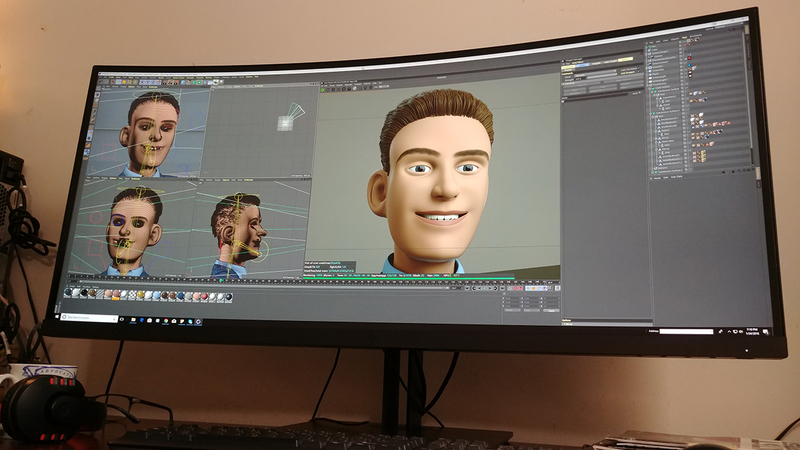 For years now, many of us who work in the production and post industry commonly have put two displays on our desks, most likely with HD aspect ratios (16:9), to allow for the extra screen real estate that is needed when doing complex tasks such as motion picture compositing, 3D animation, and editing. Since these applications usually require lots of screen space, two displays help to accommodate the plethora of control panels, pallets and viewports common to those applications. 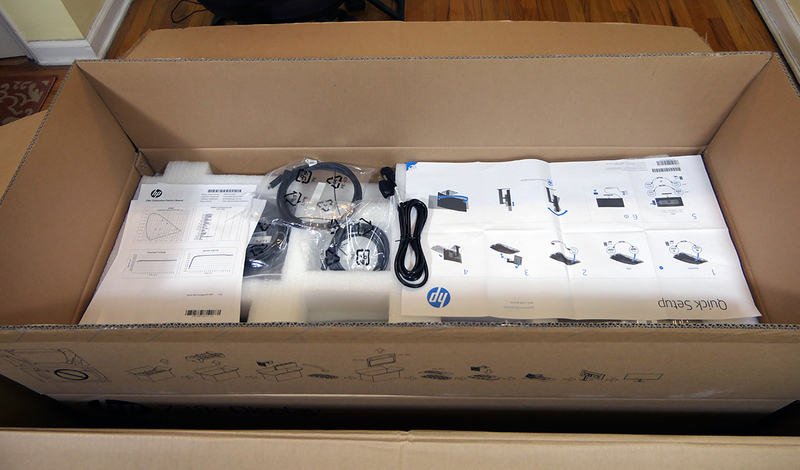 Cracking open the box for the HP Z38c reveals an assortment of connection cables, a quick setup guide as well as a factory calibration report on top. While having two HD monitors on your desk does offer more screen space, there are a few problems with that approach, a main one being the physical gap that exists between the two displays. This gap makes it impractical to stretch a window or panel across them. If you’ve ever tried it, you’ll know what I mean. While it’s possible in theory, the gap between the two machines doesn’t lend itself to spanning a window or stretching an editing timeline across both screens. Discrete pallets, or entirely different applications can exist separately on each display, however individual windows and pallets must be restricted to one screen at a time. In recent years, UHD 4K 16:9 displays made it onto people’s desks, and with them came four times the amount pixels to work with. However, UHD displays came with their own share of problems. Due to their squat 16:9 format and the fact that many 4K monitors were physically about the same size as FHD displays, more pixels just meant tiny pixels. While it was nice to have more of them, the result was that you would have to squint to see tiny icons and miniscule text — not fun, and not really better. While Windows 10 does much to address these issues, not every application is so compliant and thus you’re left with squinting at tiny user interface elements on your screen. In fact, it’s so problematic that two FHD monitors are usually preferable, even if there are less pixels overall. The new HP Z38c display takes a different, and frankly, much better approach. Rather than having a 16:9 ratio, as many displays have traditionally been, its screen is dramatically wider. How much wider? More than twice as wide, with pixel dimension of 3840 x 1600, 37.5-inch diagonal measure and a 21:9 aspect ratio. 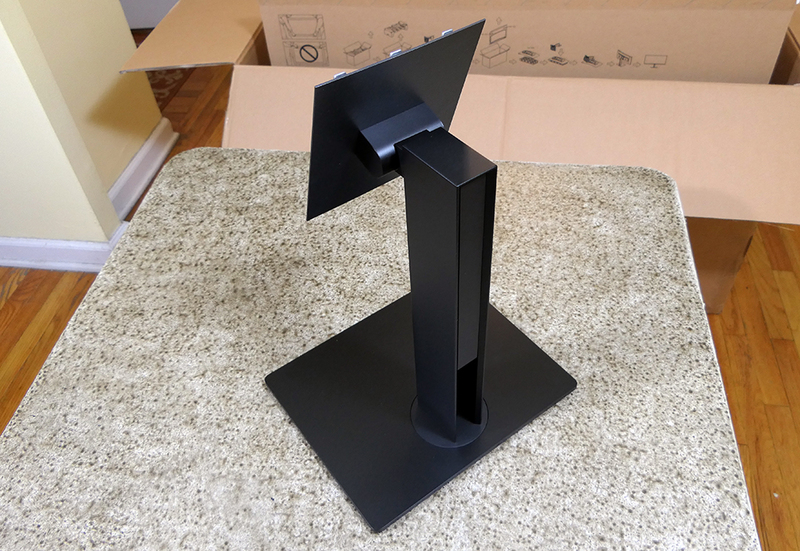 First thing out of the box was the Z38’s sleekly designed stand. Next came the HP Z38’s impressively wide curved display panel. That means that getting a Z38c is more or less equivalent to having two HD monitors on your desk. Actually, it’s better since HD displays measure 1080 pixels vertically while the Z38c is 1600 pixels deep. But there’s an even better reason to have an HP Z38c on your desk instead of two separate monitors, and that is, of course, because there is no gap between them. As mentioned before, this makes an enormous difference because it allows you to stretch windows, control panels, timelines and other elements across the entire span of the display in a way that you can’t do with two separate monitors, and it really makes a tremendous difference. Working in a 3D package like Cinema 4D, the extra-large viewport makes it easier to animate and I was able to open Octane Render’s Interactive Preview Render (IPR) window and dock it next to the 3D viewport for continuous updating to the real time render. Retouching a large image in Photoshop in conjunction with a Wacom tablet is also much improved thanks to the wide dimensions of the window. You can really get your arm moving with broad and expressive strokes or focus in on an area without needing to constantly scroll around. Aside from its 37.5-inch diagonal measurement and its 4K-wide 3840 x 1600 pixel dimensions, the display is 110 pixels per inch. That means the pixels are not so tiny that you can’t see what’s going on but fine enough to offer up high-resolution results. As soon as I connected the HP Z38c display and turned on my system, I saw this landscape which felt as expansive as the display itself. The landscape is part of Windows 10. The HP Z38c is like having two displays with ample room to run two applications side by side. In this case, it’s Adobe After Effects (left) and Adobe Illustrator (right). Another way the extra wide horizontal span of the Z38c comes in very handy is when mixing audio. I opened a large Pro Tools session of a song I recorded that had tons of tracks. On the mixer, it was great to be able to see every fader and level at once. With the mixer spread out across the wide display made me feel like I was in a recording studio sitting behind a large mixing console. Working on long waveforms and midi data was also a lot easier thanks to the Z38c’s super wide 37.5-inch diagonal width. However, one of the greatest benefits of the wide dimensions of the Z38c comes when editing. I happened to be editing a new cut of my reel when the display arrived. After connecting the display to my workstation, I opened the project and stretched out the editing timeline across the entire display. I’m sure editors everywhere can imagine what a difference this will make, since working with a timeline is, for lack of a better word, very much a horizontal process. With the HP Z38c, your timeline can be twice as long than that on an FHD display, making the process of editing a lot more efficient and pleasant. 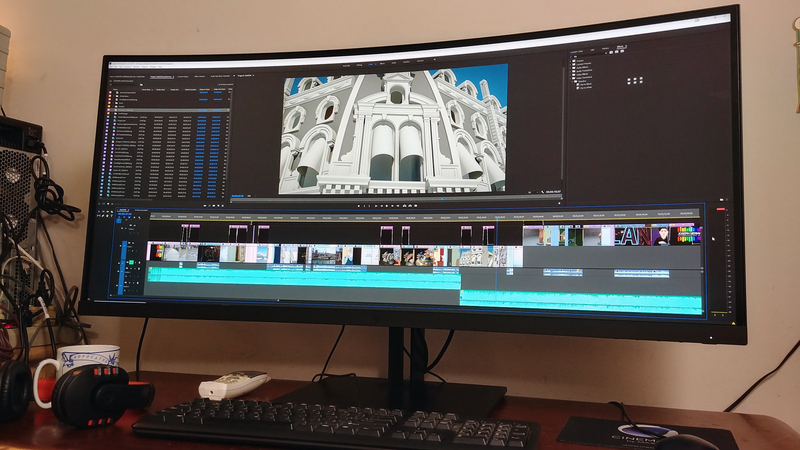 One of the greatest things about using a wide display like the Z38c is that editing timelines can extend over the breadth of the entire display, making cuts and edits much more convenient to work with. Here’s a picture I took while editing my demo reel in Adobe Premiere. Working in a 3D animation package on the Z38c, in this case Maxon’s Cinema 4D, allows more room to navigate through the viewports. There is also room to dock Octane’s Interactive Preview Render window to the interface (in the middle) for real time updates. Another important feature of the display, besides its wideness, is, of course, the fact that the Z38c is curved with a 2.3m radius. When glancing at the far left and right edges of the screen, not only do you feel like you are completely immersed in what you are doing due to the curve, almost in a VR sense, but it also maximizes the ideal viewing angle across the breadth of the display. As you might know, the best way to view any display is by looking at it head on, or as close to head on as you can manage. While this is more of an issue with lower quality displays, still, it’s best not to view pixels from a skewed angle. The subtle curve of the Z38c helps to optimize the viewing angle from every angle, ensuring that you get the best color no matter where you happen to look. Speaking of color, while the HP Z38c is not a DreamColor display, it is factory color calibrated and achieves 98% of sRGB. In addition, the panel has a 10-bit color depth. That means color accuracy is very good and 10 bits per channel offers over a billion possible colors (many other displays only offer 8-bit color). With 10-bit color, subtle color variations and gradients appear smoothly without unsightly banding. The Z38c features 98% coverage of sRGB on the Z38c which is great for creative work. I’ve worked on a few production jobs with it and found that it delivers reliable, consistent and crisp 10-bit color. While HP’s DreamColor line of displays technically offers 100% coverage of sRGB, it’s frankly hard to notice the difference. The HP Z38c allows several different ways for you to connect to your computer including DisplayPort and HDMI 2.0 connections. However, the display also has a USB-C connection which connects data, video and up to 65 Watts of power making it, by itself, a fantastic way to connect to your workstation, especially if you are powering it from a mobile computer such as an HP ZBook. The rear of the HP Z38c. You can mount it on the stand or on a VESA mount. Ports on the back of the display include HDMI 2.0, DisplayPort, Audio Out, two USB 3.0 ports and a security lock. The USB-C port, which can deliver video, audio and power to the display is on the side. The rear of the display also has USB 3.0 ports for easy connection of peripherals including mice, tablets and keyboards as well as audio out, a security lock and the power connection. On the front, at the bottom of the panel, are a set of menu buttons for adjusting and customizing display preferences. The design of the Z38c is modern and dramatic and I can almost guarantee that if you put one of them on your desk, be ready to attract a crowd of admirers. Its ergonomic and minimalistic stand not only allows you to adjust the display’s height, tilt and swivel, but it’s also removable, revealing an integrated mm VESA pattern for mounting on standard VESA compatible stands. 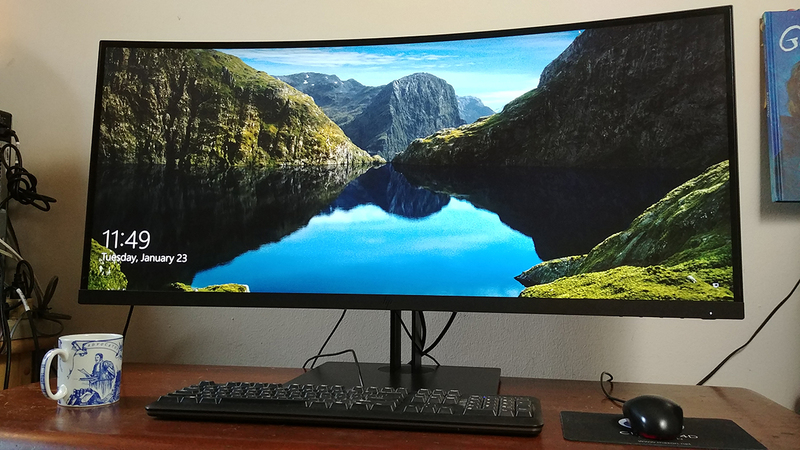 By now, you’ve probably surmised that I’m a fan of the HP Z38c Curved display. Not only do I find it to be a high quality display to work with, but it represents the wave of the future, especially for the production and post-production industry. Why have two FHD displays on your desk when you can have one Z38c? 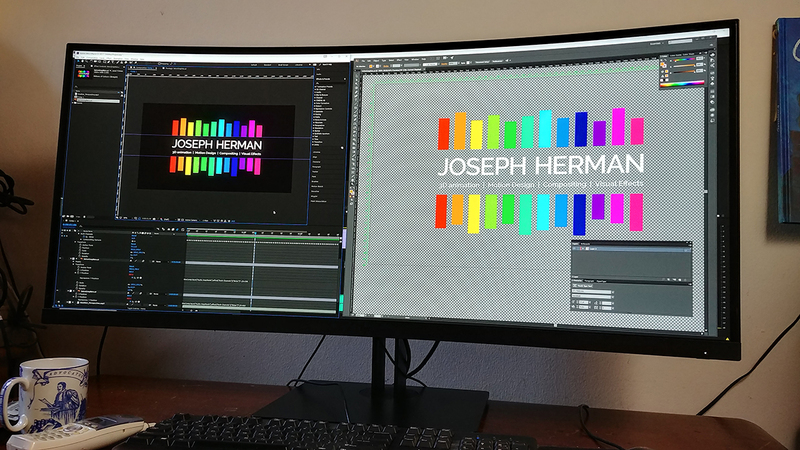 The only thing better would be to have two HP Z38c curved displays on your desk. Now that would be amazing (though you would need a really big desk).